Today Search Engine Optimization (SEO) is more important than ever. As the online environment has become more competitive websites that ignore SEO factors are falling to the wayside. “The number of internet users has increased tenfold from 1999 to 2013. 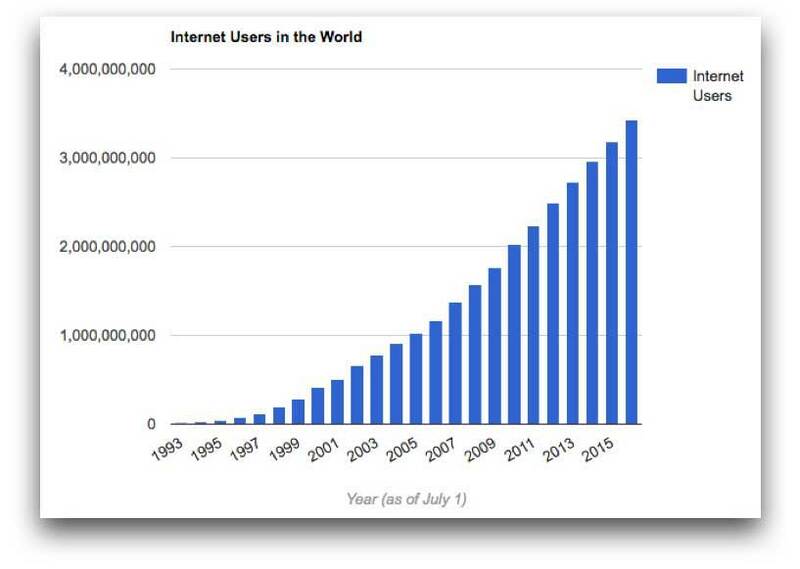 From the graph above we can see internet usage is still booming. It’s very easy to look at this and see the potential. And you should. But with that growth has come competition. According to Netcraft there are over 170 million active websites as of June 2016 and growing. Over 3 million posts written per day. This can seem a bit overwhelming, but there is a silver lining if you look a bit closer. Your competition is small compared these numbers. According to Statista over 40% of worldwide internet users have bought products and services online, and it is expected to keep growing. According to Google 4 out of 5 consumers use search engines to find information about local businesses. The one stat that can’t be found is the most important. How many websites use SEO techniques? If we had a way to measure this on a large scale, I think it would be very revealing. Let’s look at an example. Query “boise idaho computer repair.” Now go to page 2. The reason I want to go to page 2 is if there is a lot of competition and it’s optimized then even page 2 will have strong local results. Here are the results from my search. I’m only listing the top 5 of page 2 of the organic results. Position 15-19 of the Search Engine Results (SERPs). I can quickly look at these results and see the competition is very weak. First look at the gray bar that is below each result. This is produced by a tool I’m using called “Mozbar” a chrome extension. 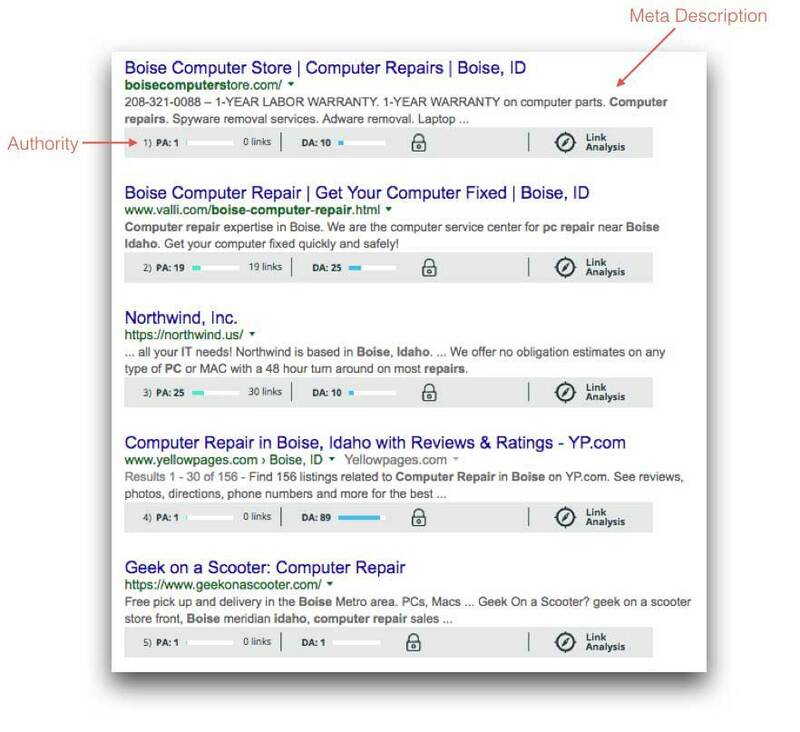 It gives me the Page Authority (PA) and Domain Authority (DA) of each result. The range is between 0-100 and the higher it is, the stronger the site. We can see these are very weak for being the second page. Only 2 have any real authority, and one is a large review site “www.yellowpages.com.” Google will include these sites when it thinks it is relevant to a user’s query. We can also see that 2 of the results haven’t even customized their meta description. A sign they haven’t invested much time if any to SEO. This tells me their on-page SEO optimization is probably less than stellar and they haven’t done any off page optimization such as link building. I can quickly see this is very competitive. Notice the lowest DA is 21, and every meta description is complete. Very obvious these sites have been optimized to some degree. There are distinct differences between computer repair and attorneys. Computer repair has become a commodity. Many people do it, and the entry barrier to becoming a repair technician is small. To become an attorney it takes years of schooling, and you must be licensed to practice. A customer is worth much more to a lawyer than computer repair. As an attorney, there are many associations you can join that have authority. It gives them the ability to get quality backlinks. 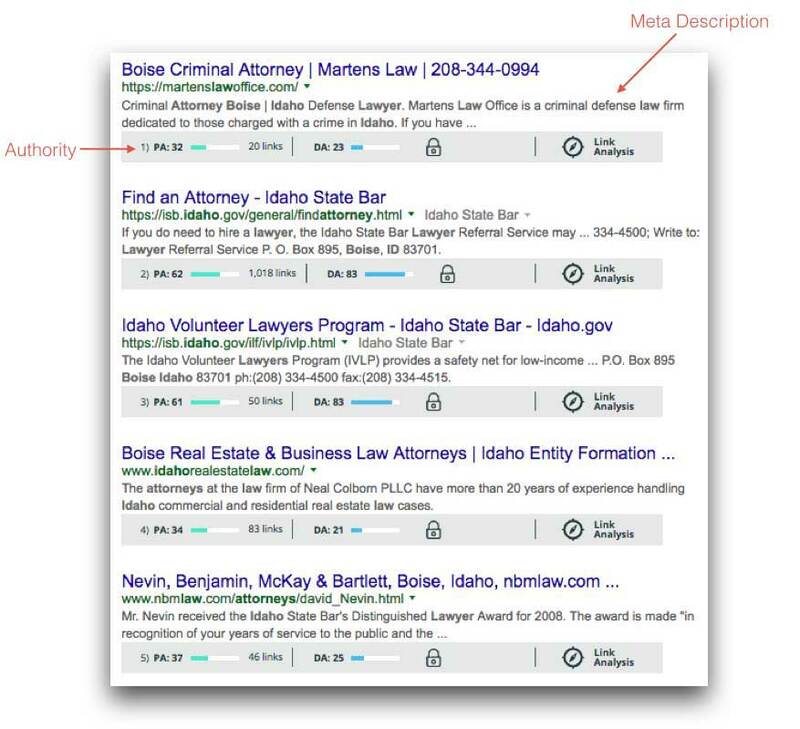 If you’re a lawyer in Boise, you are going to need at least a good SEO consultant if you want to be competitive. The amount of money and resources needed to rank your site for certain keywords depends on your competition. Do you want to rank locally, regional, national, or global? How competitive is your niche? What kind of resources do your competitors have? What has your competition done to optimize their site? Questions like these are going to determine what it will take for you to be competitive. The more traffic potential, the more money involved. The more money involved, the more resources companies have to invest to improve their rankings. The potential of SEO can’t be overstated. A good SEO company pays for itself in the long run. If you want search engines to rank you on the first page, then you have to give them a reason too. If you want to learn more about what we can do for you, click “Request A Consultation” below. Talk directly to the owner, not a salesman. Not sure where to start? That’s ok. Give me a few minutes of your time to discuss your current problems and I will help you identify solutions.